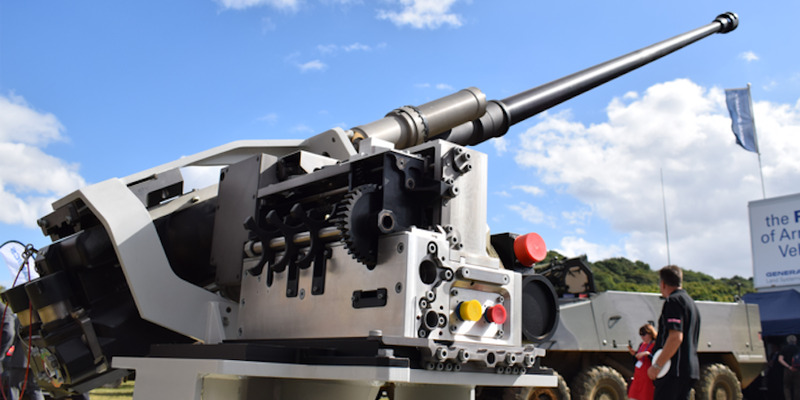 BAE Systems recently showed off its new 40mm Cased Telescoped Cannon at Fort Benning in Georgia. The US Army is looking to add more firepower to its Strykers, Bradleys, and other armoured vehicles. The 40mm cannon fires six different kinds of rounds, able to take out a variety of armoured vehicles and even older tanks. BAE Systems showed off its new 40mm cannon at Fort Benning in Georgia last week, as the US Army looks to add more fire power to its Strykers, Bradleys, and perhaps other combat vehicles, according to Defence News. “Everything went perfectly,” Rory Chamberlain, a business development manager at BAE Systems, told reporters after the cannon was fired, Defence News reported. BAE Systems is one of the largest defence companies in the world. CTA International, a joint venture between BAE Systems and Nexter, began developing the weapon in 1994, and the gun was recently chosen by the UK and France for their new Ajax and EBRC Jaguar armoured vehicles, according to The War Zone. The cannon has six kinds of cased telescoped ammunition (meaning the projectile is in the cartridge with the charge), including aerial airbust rounds, airbust rounds, armour piercing rounds, point detonating rounds, and two more designated for training. 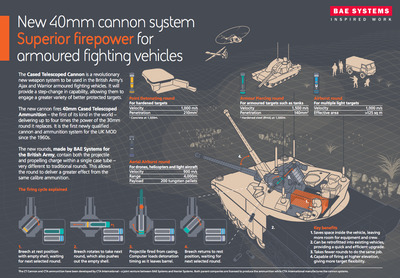 The 40mm rounds are up to four times stronger than 30mm rounds, according to BAE Systems. You can read more about the specs for these rounds here. Depending on which round is used, the cannon can take out a variety of armoured vehicles and even older tanks, like the Russian T-55, The War Zone reported. One of the most benefitial features of the gun is that it can fire at a high angle, making urban fighting easier, according to Defence News. Chamberlain told Defence News that “Stryker lethality is open, as much as they got the Dragoon, that is a fat turret and it’s doing its job and it’s what they wanted,” adding that the lethality and requirements for the upgrade are still to be decided. He said the same is possible for the Bradley, but Maj. Gen. David Bassett told Defence News in late 2017 that the Army is looking to replace its 25mm Bushmaster with a 30mm cannon.